Dr. Nawrocki and the rest of the team in our office enjoy helping entire families to reap the benefits of excellent oral health. We have a special place in our hearts for children. Whether it’s time for baby’s first dental visit, or you have concerns about your little one’s developing smile, we’re eager to help you. The majority of children don’t get introduced to their dentist until they’re over 2 years old — and that is far too late! In fact, the American Academy of Pediatric Dentistry recommends that children have their first dental appointment before their first birthday, or within six months of when their first tooth erupts. 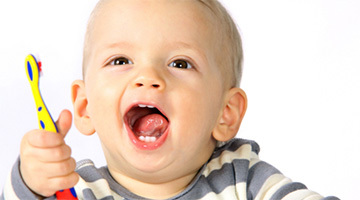 This first visit is important because it allows the dentist to check for any areas of concern in your little one’s smile, and it gives you an opportunity to learn from an expert how you should care for your baby’s teeth and gums at home. Also, establishing a routine of dental visits at such an early age will help your child get used to having their mouth worked on and help them adopt a positive view of their tooth doctor. Your child may sit on your lap during their appointment so they stay as calm as possible while Dr. Nawrocki performs an exam. He’ll check to make sure that your baby’s jaw and teeth are developing normally. Your child’s tooth (or teeth) may also undergo a quick cleaning. 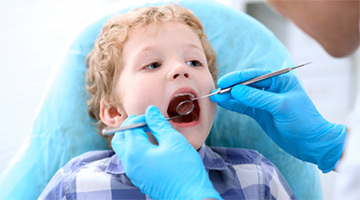 You should schedule a dental appointment for your child every six months or so. Not only are cleanings and exams important for preventing problems, but we also offer other services that protect young teeth and gums. For example, we recommend sealants for children who have their permanent molars. Fluoride treatments can help to strengthen developing teeth and prevent cavities. As your child gets older, they may become involved in sports; we can provide a custom mouthguard for them to reduce their risk of oral injuries and concussions. Brush and floss your child’s teeth for them until they develop the dexterity to do a thorough job on their own. As a general rule of them, a child who can tie their own shoes can look after their own oral hygiene. However, you should still supervise their routine you’re confident that they’ve mastered brushing and flossing techniques. Keep an eye on your child’s sugar intake. Candy and other sweet treats are well-known sources of sugar, but they aren’t the only threats to your child’s teeth. For example, babies who go to bed with a bottle of milk are prone to tooth decay because the sugar from the milk stays on their teeth for an extended period of time. Educate your child on the consequences of poor habits. When your child understands how important it is to brush and floss, they’ll be more likely to keep a clean and healthy mouth throughout their lifetime.